Photo: Jenn Hall City Hall was built over a 30-year period beginning in 1871. Situated on the grounds of one of William Penn’s five planned city parks, it serves as both governmental and civic space. This is especially true come winter, when the on-site ice rink opens at Dilworth Park. With nearby Love Park under construction, both its namesake sculpture and the Christmas Village moved here for 2016. Photo: Jenn Hall Open through Christmas Eve, the market is expected to attract more than 780,000 shoppers. Meandering 80 wooden booths filled with festive food and wares, it’s easy to summon the holiday spirit. The event is inspired by German Christkindlmarkets, rooted in the Middle Ages. Tinged with Bavarian details, Philly’s is modeled after the famous one in Nuremberg. Photo: Jenn Hall Its roots are Ottoman, but döner kebabs may top the list of German street foods. (Just don’t tell the currywurst.) In part, their popularity can be traced to Turkish migration after WWII and a unique Berliner style that emerged in the 1970s. Maybe. That part of the story is as contentious as the spelling, but one thing is certain. These savory pita sandwiches are incredibly delicious. Photo: Jenn Hall A fixture in the urban landscape, Philly Jesus (aka Michael Grant) shows up all over the city. Part street performer, part evangelist, he’s known for treks with large wooden staff in tow. In keeping with a “better to give than to receive” ethos, he stopped to tip a performer in the courtyard during opening weekend. Photo: Jenn Hall Wandering, you’ll uncover sweet tastes of Deutschland, including greetings in gingerbread form. Lebkuchen date back hundreds of years, with a League of Lebkuchen-Bakers established in the 1600s. “Weinnacht” is Christmas Eve, when German children open gifts. Though the earliest gingerbread recipe is thought to be Greek, Germans have made it an art form. Photo: Jenn Hall The “Christmas Cottage” is a savory stop, luring hungry shoppers with grill smoke and cheer. If döner kebab rules the street-food scene, bratwurst may just get top billing at the Christkindlmarkt. Lines snake throughout the day for this savory meal in a bun, a Nuremberg specialty. Vegetarians can opt for potato pancakes. Photo: Jenn Hall Buskers and street performers liven the scene, including this feather-bedecked magician who draws enthusiastic crowds. A main stage hosts events throughout the week, from brass bands and folk dancers to a bratwurst-eating contest. Philly-based artists are heavy in the mix, creating a fun, Euro-meets-local vibe. Photo: Jenn Hall PA basswood honey from Draper’s Apiaries infuses these Philly-made chocolates. Purveyors of all things decadent and wonderful, John & Kira’s have a storytelling bent, reveling in the narratives of their partners. It’s little surprise then that these happy treats fly off the shelves. As adorable as they are sweet, each bee is hand-painted. Photo: Jenn Hall Those who prefer chocolates sans honey may wish to try these dark-chocolate-and-caramel whimsies. Inside perfect little magic mushrooms, caramel is flavored with salt, rum-pecan and chili. John and Kira have been crafting chocolates in South Philly since 2002. Photo: Jenn Hall There comes a time when one needs more finger puppets in their life. OK, perhaps this is a stretch – but when they are this adorable, it’s hard not to splurge on a handful or two. Clearly, life is better lived when one’s pointer finger is bedecked in a handmade dachshund puppet, no? Photo: Jenn Hall There is something undeniably festive about a paper cone full of sugar-roasted nuts when the mercury dips low. Caramel-scented, they offer a satisfying crunch and are easy to carry around while scoping out the next indulgence. A fixture at holiday markets, their perfume is intoxicating. Photo: Jenn Hall More than 50 German-made Herrnhut stars dot the Christmas village, each featuring a patented 25 points. 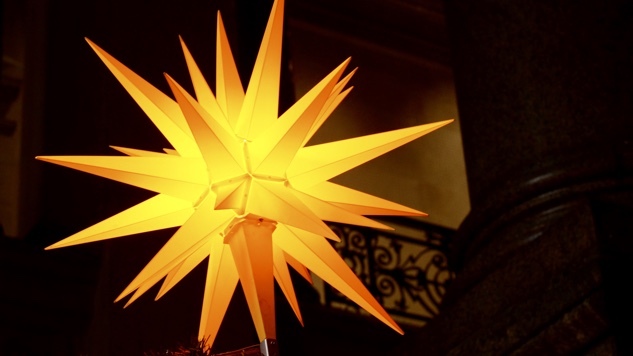 A traditional Moravian decoration during Advent, they were first manufactured commercially in the 1890s. Those enchanted by the golden light can purchase one to bring home. Photo: Jenn Hall Fruitcake phobia shouldn’t prevent you from savoring the stollen, a traditional cake rolled out each Christmas. Full disclosure: there are raisins involved. Legends abound regarding the shape of the cake, some claiming it represents the humps of a camel en route to Bethlehem. They’re certainly portable, and make for an east addition to a holiday brunch. Photo: Jenn Hall After that rigorous workout, you may be in need of a refresh. Luckily, these fine, Marseille-style soaps are on offer in a rainbow of scents. Lemon and verbena make a festive pairing in citron and green, but there’s something to suit any taste among these 100 percent natural and lovely bars. Photo: Jen Hall If you require mulled wine in a hot second (and let’s be real, who doesn’t?) Glühfix has you covered. Just pour yourself a mug of red or white vino, heat it up, and drop in a tea bag filled with cardamom, orange peel, and other warming spices. In five minutes flat, you’ll be transported to an Alpine village. Photo: Jenn Hall On the West side of City Hall additional attractions entice the crowds, including a garden maze and ice-skating rink. Designed to showcase elements from 32 garden spaces across the city, it’s a nice reminder that the natural world continues on come wintertime. Photo: Jenn Hall From poutine and funnel cake fries to ginger cider spiked with Jim Beam Apple, the Rothman Cabin offers a respite from the elements. This being Philly, grass-fed sirloin cheesesteaks are on the menu, fancied up with provolone fondue and grilled onions. Seating looks out over the ice rink, and happy hour events are held throughout the season. Little ones will be interested in brunch dates with Santa. Photo: Jenn Hall It’s cold outside. You know what to do. Order a Holiday Hot Fudge sundae with peppermint ice cream and revel in it. Franklin Fountain is the aesthetic brainchild of a pair of dapper gents, the Berley Brothers, purveyors of fine ice cream since 2006. They do things the old-fashioned way, and that’s a good thing indeed. Leave room for a German-style springerle cookie baked off in a Victorian-era mold. Photo: Jenn Hall Those with a sugar tooth and a retro bent mustn’t overlook Shane Confectionary, “brother company” to Franklin Fountain. The Berleys took over America’s oldest continuously run candy shop in 2011. Befitting a Philly history dating to 1863, treats are vintage in style, from malt balls to clear candies crafted in antique molds. The latter are a PA-Dutch Christmas classic. Photo: Jenn Hall Lest one forget the spirit of the season, a heart-filled wish wall has pride of place near the market’s main stage. Each heart purchased serves as a donation to the Make-a-Wish Foundation. Wishes span everything from health and wealth to a new season of Parks & Rec. Hey, you never know. Photo: Jenn Hall After a full day of shopping and snacking, a celebratory drink is in order. Commemorative mugs can be filled with pours of cocoa, coffee, or something stronger – like mulled or hot apple wine from Chaddsford Winery. This echoes another German market tradition, where a new design is introduced each year. Prost! Photo: Jenn Hall As city employees, tourists and residents come and go throughout December, City Hall serves as a center point for all things holiday cheer. One thing’s for sure: it’s got to be one of the merriest locations in Philly. Blink and it’s easy to imagine that you have been transported to a Bavarian enclave. Lights twinkle and the winter air is crisp. Charming wooden stalls beckon with artistic and delicious treats. Shoppers snack on döner kebab while children twirl across the on-site ice rink. Only the 27-ton sculpture of William Penn reminds you that you are in Center City, Philadelphia. Taking over much of the public space that surrounds the city’s glorious City Hall, Philadelphia’s Christmas Village evokes a traditional German holiday market, right down to the bratwurst. This is fitting, given the city’s history. By the late 1700s, nearly 30 percent of Philly’s foreign-born population was German, second only to the Irish. Today, 3.3 million people across the state claim German heritage. If your holiday fantasy budget doesn’t allow for airfare to Europe this year, this may be the next best trip. Here’s how to do it: 1) Bang out that holiday shopping list. 2) Feast on a range of European treats. 3) Hit the ice rink or garden maze. 4) Toast your amazing day with a mug of steamy glüwein or an icy adult beverage. It’s a delicious way to while away an afternoon. Jenn Hall writes about food and culture from a Jersey-side suburb of Philly. Follow along on Instagram and Twitter @jennsarahhall.